Kiwi Design are proud to have recently completed the extension and refurbishment of JD Sports in Liverpool One shopping complex. Incorporating an adjacent unit has given a total area of 40,000 sq. ft, making JD Sports Liverpool One the flagship store for the North of England, stocking their entire range of products. Founded in 1981, JD Sports in the UK’s leading sports fashion and trainer retailer, with exclusive designs from Adidas and Nike, and other limited edition products. The company now has over 900 stores in the UK. Liverpool One is the second largest shopping centre in North West England and is a recently new complex, having opened in 2008, with 170+ stores, bars & restaurants, as well as a leisure complex, hotels and residences. The interior of the new store on Paradise Street was designed by Brinkworth, a London-based retail design company. Brinkworth have also designed stores for other highly recognised brands such as Selfridges, Karen Millen, Ben Sherman and All Saints. The adjacent Unit was previously occupied by SuperDry who have moved to a new, considerably larger, 10,000 ft. store on Liverpool One’s South John Street. JD Sports impressive corner store opened in November 2017. Warren Thompson, head of acquisitions at JD Sports, said: "The team worked incredibly hard to launch our new store in time for Christmas at Liverpool One and we are delighted with the results. JD Sports has always excelled in Liverpool One, but this new store is set to take the brand's performance to another level. We are very excited to welcome visitors to the spectacular finished product, combining the very best mix of brands and product lines with an outstanding experience for our customers." JD’s range of footwear and sports fashion is spread across two floors. Multiple LED screens on the 1st floor balcony can be seen from the street through the double height glazing. Unique features to this store include a dedicated JD Football Zone and a footwear chute in the centre of the store. This allows shoppers to browse footwear styles on an iPad, receive the box of their chosen style and size via the chute for trying on. As part of the Fit-Out for Liverpool One, Kiwi Design removed and erected walls through the building, including installing new steel beams where needed. Other responsibilities included installing the glass balustrades and other casing around the elevators and footwear chute, tiling throughout and mesh panels around the first floor. Kiwi Design also created a new staffroom and feature ceiling. 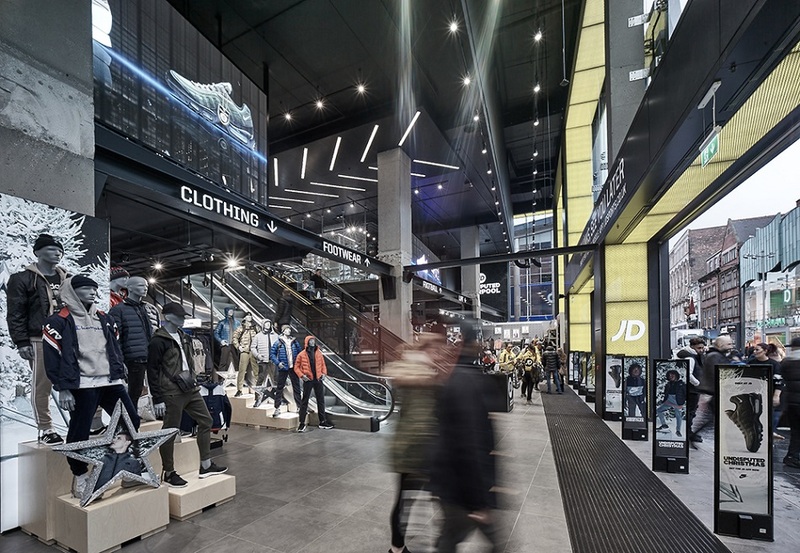 Kiwi Design are proud to have been part of this impressive and high profile build for JD Sports in the Liverpool One Shopping Complex. Other JD Sports recently completed by Kiwi Design include Poole, Brent Cross, Manchester Arndale, Trafford Centre, Cribbs Causeway, Wednesbury and Meadowhall among others. For more photos of the works completed at JD Sports Liverpool One, please see our JD Sports Case Study.